Protect and unify intolerant skin with the Avene Mineral Tinted Fluid SPF50+, a tinted, mineral-based sun cream that will defend and calm sensitive skin. The Avene Mineral Tinted Fluid SPF50+ keeps your skin defended against harmful UVA and UVB filters with its high protection level and broad spectrum formula. Designed to reduce the risk of sunburn, this water-resistant and photostable formula uses the powers of mineral-based complexes to provide your skin with maximum protection. Lightweight and sheer with a tinted matte finish, this unique formula is enriched with antioxidant pre-tocopheryl to prevent cellular damage. In addition, the infusion of Avene thermal spring water soothes irritated skin whilst hydrating and calming any uncomfortable areas. Apply to skin before sun exposure, and then re-apply the Avene Tinted Mineral Fluid SPF50+ frequently, especially after swimming or prolonged periods of exposure. Avoid exposure between noon and 4pm. Zinc Oxide [Nano], Avene Thermal Spring Water (Avene Aqua), Titanium Dioxide [Nano], Coco-Caprylate/Caprate, Isocetyl Stearoyl Stearate, Isopropyl Palmitate, Isodecyl Neopentanoate, Isododecane, Isohexadecane, PTFE, Triethylexanoin, Dicaprylyl Ether, Peg-30 Dipolyhydroxystearate, Iron Oxides (CI 77492) (CI77491) (CI77499), Mica, Aluminia, Stearic Acid, Caprylyl Glycol, PEG-45/Dodecyl Glycol Copolymer, Silica, Benzoic Acid, Caprylic/Capric Triglyceride, Disodium EDTA, Disteardimonium Hectorite, Glyceryl Behenate, Gylceryl Dibehenate, Helianthus Annuus (Sunflower) Seed Oil (Helianthus Annuus Seed Oil), Pentaerythrityl Tetra-di-butyl, Hydroxyhydrocin-namate, Polyamide-3, Sodium Chloride, Titanium Dioxide (CI77891), Tocopheryl Tocopheryl Glucoside, Tribehenin, Triethoxycaprylylsilane, Water (aqua). 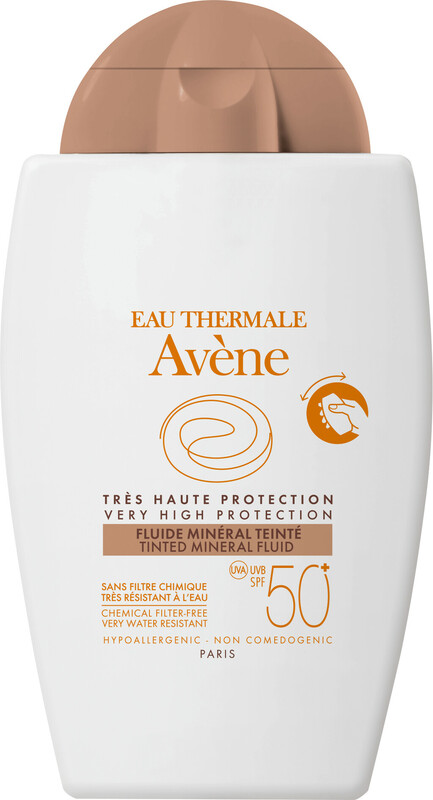 Avene Tinted Mineral Fluid SPF50+ 40ml is rated 4.7 out of 5 by 6. Rated 4 out of 5 by Rowena53 from Good summer product This provides good coverage without being heavy or cloying. Very good when the weather is just too hot for foundation but you need more than a bare face and also want skin protection. Colour is a little 'flat' and a range ( fair, medium, dark for example) would be preferable but perfectly wearable. Good purchase that I have used daily through the summer. Rated 5 out of 5 by JackieM from A great tinted moisturiser with huge SPF I used Avene products all the time as I have extremely sensitive skin, Avenue is ideal and has never caused me any irritation issues at all. This tinted moisturiser is like having my best Avenue moisturiser plus a make up all in one. It;s very comfortable on the skin, and is just the right tone for me. I would thoroughly recommend this. Rated 4 out of 5 by LuckyLiz from sun spots the product was quite heavy on the skin, but successfully covered sun spots. I would recommend this product as it is a good substitute when going somewhere special and a good alternative to ordinary make-up which only has a low SPF. This one has a whopping 50+SPF, which is great, especially when a higher SPF level is essential. A pity the bottle isn't larger! Rated 5 out of 5 by Deborah48 from Beware English Roses I love this mineral sunscreen. The application and finish are delightful and I give it full marks without hesitation but be warned that it is not for you if (like me) you are light, pink toned. It is quite dark with definite yellow undertones. I am mixing it with Neutrogena Senstive Face which is a 30spf mineral sunscreen for faces. It's white so makes it wearable for me but reluctantly, I won't be buying another.